Users set up new climate model simulations usiing the Setup Simulations window. Experiments are designed within a feature called “Setup Simulations”. This window is an interface for manipulating the GCM itself, with well-defined fields for entering the names of input files and setting initial boundary conditions for each experiment. The interface is divided into several logical sections, each of which the educator can show or hide depending upon which components of the GCM they want to focus of study. Point-and-click controls for choosing a variety of modeling options (e.g., number of simulated years per experiment, levels of greenhouse gases in the atmosphere, orbital parameters, and paleocontinental configurations) are available within each section. With the guidance of the Setup Simulations window, educators and students can easily run experiments that simulate a wide variety of climates, from future global warming to past ice ages. Endless thought experiments are also possible, to test the sensitivity of the climate to hypothetical changes in solar luminosity or greenhouse gas levels. 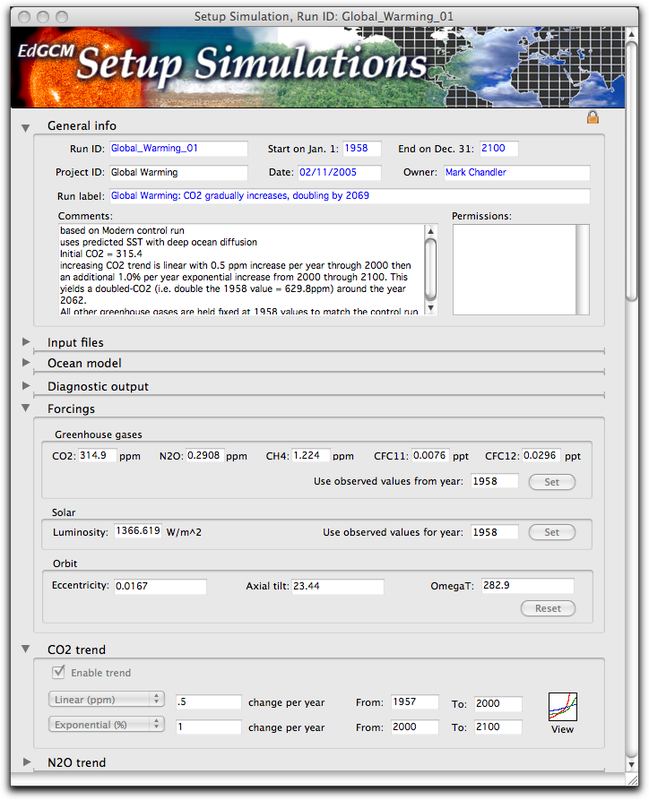 Examples of past, present and future climate simulations are provided with EdGCM, and may either be run directly, or copied and modified within Setup Simulations to produce an array of related experiments. The new interface allows such detailed control over model functions that EdGCM arguably has more user-definable capabilities than does the original GCM.